If you aren't drinking green tea yet, this is your year to start. New studies have revealed more reasons why green tea is such a "hot" item. It has long been praised for its antioxidant power, which can prevent the damage of our cells. And with its established cancer-fighting, happiness-boosting and brain-saving abilities, the benefits of green tea are numerous and compelling, with this ancient drink now being shown to help protect DNA, your teeth, and maybe even your body after a workout. There are many ways to enjoy this powerful drink, whether you have it as a matcha green tea latte, mixed with flavours like pomegranate or blueberry, or as the classic loose-leaf version. Steeped green tea at a warm (not boiling) temperature gives our body the potent flavonoids that provide many of the benefits listed here, says Ara Wiseman, an expert nutritionist and author who specializes in disease prevention. Research says by having an average of two to three cups a day, you can reap the rewards of this delicious drink. So sit back, grab a cup and learn more about reasons to make green tea part of your daily routine. Drinking two cups of green tea per day will significantly lower DNA damage, according to a recent study published by Mutagenesis. The study had Type-II diabetes patients drink green tea for 12 weeks, and found that having two cups a day protected their DNA cells from harmful damage. Green tea is full of powerful antioxidants (called catechins) says nutritionist Ara Wiseman. The antioxidants trap harmful molecules known as free radicals that contribute to aging and the breakdown of organs. During hockey season, a few Canadians will likely lose a tooth on the ice. If the tooth isn’t replanted immediately, the cells around the tooth can die, making it impossible to reinsert. Using green tea that was boiled for five minutes, filtered and cooled to 4° C worked just as well as HBSS, says a study published in the Journal of Conservative Dentistry. It’s antibacterial, anti-oxidative and anti-inflammatory effects make it an ideal candidate for those who don’t have quick access to HBSS. “Green tea has a natural antibiotic effect,” Wiseman says, and so it prevents tooth decay by “killing bacteria in the mouth.” That goes for the teeth in your mouth, too. It seems odd to have something hot before and after a workout, but green tea could be a new exception. An article published in the Bulletin of Experimental Biology and Medicine found that green tea can bring your body back to normal by stimulating blood cells. Decaffeinated green tea was given to rats for two weeks before and after they would swim or run. Endurance went up during their exercise, and the green tea seemed to prevent a decrease in iron. This could prove beneficial for people with anaemia. For everyone else, the antioxidants in green tea could help create and bring blood cells back to normal so your body can workout longer and recover faster. There isn’t a recommended dose of green tea, but drinking two to three cups of green tea per day will give your body these benefits. 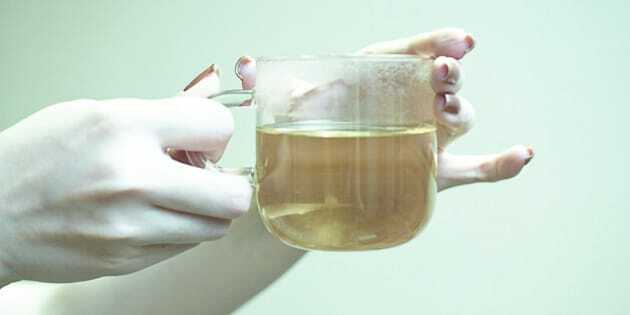 A study was done on three common types of oral cancers at the First Hospital of Jilin University in China to see if green tea could prevent the creation of these cancer cells. The group found that green tea significantly stopped or decreased the increase of these oral cancer cells. Although the study still needs more research, Wiseman believes the antioxidants in green tea prevent the growth of harmful cells. Cyclophosmamide is a drug that treats cancers like leukemia and lymphoma, but is also known to cause infertility in male patients. According to a new study by Toxicology Reports, green tea could help prevent the infertility caused by this drug. Researchers found that infertility was lower in mice that were given green tea for two weeks before treatment. Everyone worries about not functioning as well in their older age. In Canada, 15 per cent of people over 65 suffer from dementia. As it turns out, green tea can help with that too by keeping your brain young and fresh! A study released by the University of Porto in Portugal found that green tea can keep brain cells stable for longer, and delay brain decline. Green tea does this in three ways: preventing the buildup of abnormal proteins, breaking them down and creating new neurons for the brain, Wiseman says. The tea “boosts activity in an area of the brain specifically used for working memory." With all these new studies coming out, it’s easy to forget all of the older but just as important benefits that come with green tea. One advantage is that it it can help prevent type-II diabetes. A study by Current Medicinal Chemistry showed that regular consumption of green tea improves type-II diabetes. This is because green tea improves the body’s sensitivity to insulin and reduces blood sugar levels, Wiseman says. Beyond the oral cancers mentioned earlier, green tea can prevent other cancers as well. The American Cancer Society believes this is because it stops the supply of blood to cancer cells. While more research is needed to confirm different types of cancers, the Mayo Clinic says that people with early-stage chronic lymphocytic leukemia who took green tea extract in pill form saw a decrease in their enlarged lymph nodes. Blood tests also showed that the extract can kill the cancerous cells. The International Journal of Cardiology analyzed nine studies and found when it comes green tea and cardiovascular disease, the more you drink, the better. Having a cup of green tea a day lowered your risk of cardiovascular disease. Having two to three cups of green tea a day decreased your risk of stroke. But if you continue to have more green tea throughout the day, the risks go down even further. The antioxidants in green tea improve blood flow and reduce the chemicals that can cause inflammation in the heart, Wiseman says. Everyone wants the secret to losing weight, and although being active and maintaining a healthy diet are necessary reach any weight loss goal, green tea may also help. Green tea supplements were used in a study of overweight and obese patients to see their effect on blood pressure. The supplements lowered blood pressure, helping to control fat buildup. Green tea also prevents the breakdown of the chemical in the body that signals to the brain that we’re full. “When levels are low, the body feels hungry,” Wiseman says. By drinking green tea you'll feel fuller longer. It turns out green tea can also help make you happier. In a study published by Public Health Nutrition, people who drank about four cups of green tea per day were half as likely to feel depressed than people who didn’t drink green tea. It found the more green tea a person drank, the less depressed they felt. Wiseman believes the amino acid L-Theanine in green tea could be another reason people feel less depressed. “Depression oftentimes is a biochemical imbalance, unresolved emotional issues, nutrient deficiencies, hormonal imbalance,” she says. L-Theanine helps make the chemicals like dopamine and seratonin that fight these problems.